The Comber Pressofiltro® PF series Nutsche filter-dryer is designed for use in pharmaceutical and chemical production facilities. The company says that these units are built with CIP systems to achieve good cleaning and to permit optimal inspection after the cleaning process. All product contact wetted surfaces are designed without dead areas, with smooth transitions of internals and without any bolted connections. Heinkel adds that for good access to the filter internals for cleaning and inspection purposes the filters are equipped with a filter base plate that can be opened. The agitator shaft sealing is achieved with a double mechanical seal and a convoluted bellows. The agitator arms have a special tooth design to achieve low friction into the product when pressing or smoothing the cake layer. 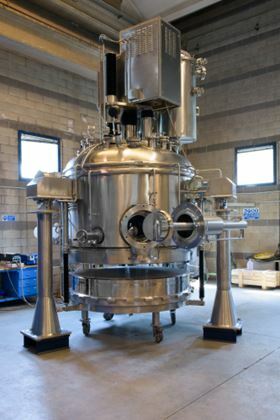 Simultaneous rotational and vertical agitator motions are claimed to result in efficient and even mixing of the entire product mass for mixing and drying. The company says that the agitator arms are S-shaped for improved product discharge. European air filter manufacturer, Hi-Line Industries Ltd, has extended its Atacama range of modular air dryers to incorporate a third filtration tower.